Because I haven't found anything that says it better . . . While much of the population was hunting for Easter eggs and posing for pictures in their pretty spring dresses and Easter bonnets we were . . . ah, painting our front door? Yes, just hours before our guests were to arrive my Dreamer and I were in our best-worst clothes painting the front door of the cottage. We'd known for awhile that the front door needed a new coat so why the last minute rush to reshade the portal? I had made a new spring wreath. The blemishes had been easy to ignore until we hung the new wreath in place. The beautiful new wreath didn't cover up the ugliness - it just enhanced it! I may be stretching the analogy a bit here but I think our Christian walk can sometimes look like my ugly door covered with a pretty new wreath. We slap a few good deeds over our sin and hope that it makes a difference. While it may help us to feel better for a time, scripture is very clear that we are not saved by works. Legalistic responses and halfhearted obedience are like putting new wine in old wineskins or trying to cover an ugly door with a pretty wreath. If you are a believer who has died with Christ then you are also raised with Christ. We can't expect to succeed in putting off our worldly desires if we don't replace them with virtues that suit God's chosen and beloved people. As Jerry Bridges says, "It is not enough to pray that God will enable us to deal with a volatile temper; we must also ask Him to help us put on compassion and kindness." 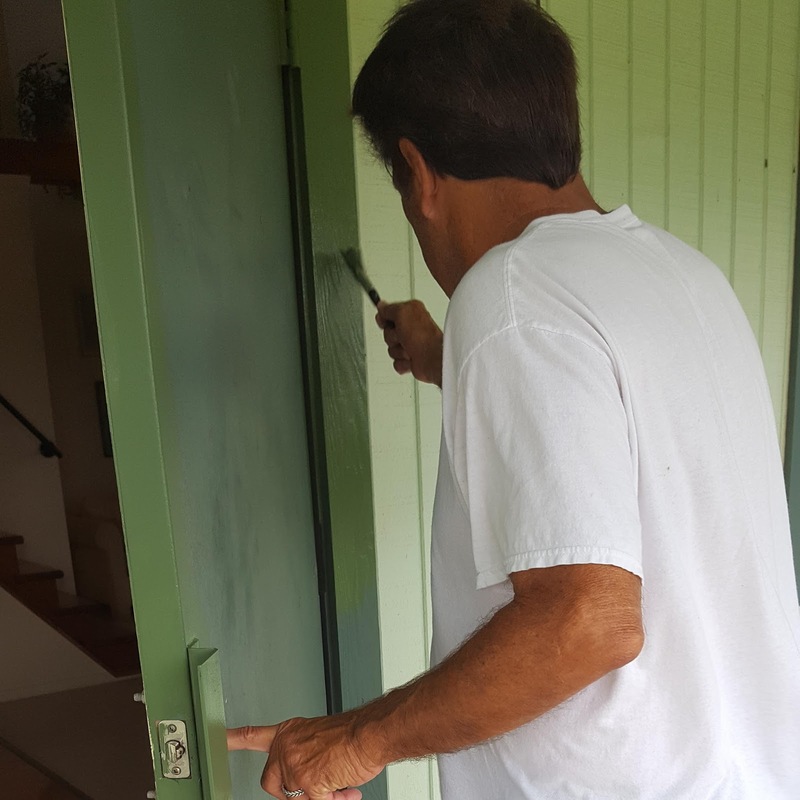 Just as our door needed a new coat of paint to match the pretty new wreath, we must put on, "compassionate hearts, kindness, humility, meekness, and patience," (Col 3:12) if we want to be like Christ in His character. If you're thinking, "Easier said than done." That's true. But don't forget it's not by our power that we will succeed, it's by the work of the Holy Spirit in our lives. Even so, we have a part to play. First, make a commitment (and tell someone about your particular struggle or commitment if you need accountability). Secondly, like we talked about last week, be aware of the motives behind your actions, and finally, most importantly, as Bridges suggests in the quote above, PRAY! Above all, even as we work to clothe ourselves with the virtues of Christ, may we remember that it is His blood and His blood alone that covers and cleanses us from sin. We had European visitors this week. Large expanses of our fields were mowed earlier in the week. If Texas heat records hold this year, it will likely be the last time we have to mow the fields before fall. Mowing always attracts the seed and insect eaters. Last year, a flock of male great-tailed grackles took up residence for a few days, much to the chagrin of the scissor-tails and the mockingbirds. This year a small flock of European Starlings showed up to indulge. I believe this is a juvenile. Bambi is growing up fast. He's interested in meeting our European visitors, too! This isn't the best picture but I thought the image of the bee was fun. It's so good to see more of them coming around this year. I don't know if this is my juvenile from last month, now in full plumage, or if it's another [adullt] male. Either way, I was thrilled to see this Summer Tanager! I wish I could have gotten a clear picture of him for you. This was taken through my window. I've spotted a greenish-hued bird a couple of times in the last week but haven't yet captured her on film. I think she is a painted bunting. Hoping to have time this weekend to sit and observe! It's hard to believe June begins next week! We've been blessed with cooler temps late into May this year. June is my favorite month and, although it's going to be busy, I intend to savor each and every day! Her friend’s question made her curious about her pot roast preparation. During her next visit home, she asked her mother, “How do you cook a pot roast?” Her mother proceeded to explain and added, “You cut off both ends, prepare it and put it in the pot and then in the oven.” “Why do you cut off the ends?” the daughter asked. Baffled, the mother offered, “That’s how my mother did it and I learned it from her! Do you ever think about why we do the things we do? What motivates and influences our actions and responses? Certainly, there are many things that influence our actions and responses. Some things we've learned from our parents, as shown in the above story. Those with whom we spend our time, our culture, abuses, work experiences, all these things contribute to how we think and, ultimately, how we act. Is it important to know and understand why we do the things we do? It is if we believe Proverbs 4:23. Most of us fall somewhere in between these two points of influence. Your attitude toward the word of God and how often you read and study the word will determine how close you are to one point or the other. Let's assume our major influences have been good. We were taught as children to do good. Perhaps we even follow the moral code of the Bible. But what is our motivation to do good? Is it simply a habitual response to our influencers or a desire for the good opinion of others? "Instead of asking yourself whether you believe or not, ask yourself whether you have this day done one thing because He said, Do it, or once abstained because He said, Do not do it. It is simply absurd to say you believe, or even want to believe in Him, if you do not anything He tells you." The apostle Paul urges us toward a commitment to God and holiness. If this commitment to pursuing holiness seems overwhelming to you, remember, "A soldier unresolved to fight may be easily defeated. "1 Remember, too, that God does not only ask us for this commitment, He provides us with the grace which enables us to do it. Taking a hard look at what motivates our actions gives us an honest perspective on where we are in our pursuit of holiness. Wherever you may find yourself, do not be discouraged. The pursuit of holiness is a life-long journey that is never fully realized this side of heaven. This past Saturday was Global Big Day! Similar to the Great Backyard Bird Count, which took place in February, Global Big Day is aimed at collecting data for worldwide conservation efforts. I spent about four hours observing from my porch and nearby fields and was able to record sixteen species. Including one that was a new bird for me! These pictures aren't the greatest, as I was shooting mainly for recording / identifying purposes and, in some cases, from a very long distance (125+ feet). Despite the quality, I wanted to share with you some of my sightings. Follow the tail and you'll see the head of the second bird on the nest. Did you participate in Global Big Day? If so, please share in the comments. And now a bonus for those of you still with me. Yesterday morning I spotted this brown blob about forty feet in front of the cottage. I watched it for a bit but there was no movement, so I thought it was just debris blown in by the wind. Imagine my delight . . .
Breakfast with Bambi. How fun! I've been spending an inordinate amount of time this past week just staring out the window. It's a nice view and there is plenty of activity to distract me but that's not what has my attention. The truth is nothing has had my attention. I've been in a brain fog all week. Slogging through life. Frankly, the fog is still, at this very moment, trying to distract me from coherent thought. and so I'm praying that by the time you reach the end of this post there will be an inspiring message that makes sense! As I said, I've been in a fog all week. For the first day or so I berated myself. You know, the negative self-talk. You shoulda, coulda, woulda, etc. That kind of talk puts you on the road to pity, which is dangerously close to pride. Thankfully, I read Karrilee's post just in the nick of time! Her sweet pep talk pointed me back to His list of shoulds for my life. Then I read Joy's post. She reminded me that our lives are never just about us. Friends, that perspective right there will officially end any pity party you might have been entertaining! I may not be feeling like a million bucks or be able to focus for more than a few minutes at a time, but I can still leave an encouraging comment on someone's blog. I can still post a daily devotional that shares God's love, or a picture that inspires. Even so, we may still feel like there is so much more we should could be doing. But sometimes life, health, or other circumstances overwhelm us and we can't do what we want to do. When I read Ruth's post this week I was reminded that there is really only one thing that is necessary. God has been so gracious this week to encourage me through the words of others, who have pointed me back to Him. My brain fog and other symptoms are likely due to a certain medication I'm taking. But whatever it is that we're facing or struggling with today a shift in our focus can make all the difference. Seek Him first. No matter how much time you lack in the morning, take a moment to pray. Seek Him throughout the day. Acknowledging His presence throughout the day will help you keep your perspective and bring a measure of peace to your situation. Seek Him last. Ending the day with words of praise and thanksgiving calms our hearts and minds to accept the rest He so graciously gives. The Psalms are God's prayer book. They never fail to refresh my spirit. When I don't know what to pray, they echo the cries of my heart. May you find encouragement in them and the Godly words of others this week. The rhythms of my days have changed. I'm trying to embrace the changes, but most days I fail. Weakness is a hard teacher. Her lessons are humility and patience. I thought I'd come farther along, but each day reveals my lack. If God's power is made perfect in my weakness then I have to trust that there is a purpose in this season. Even though I can't see it now, He is perfect in all His ways and I must trust Him and this process. I wonder if this cloak of darkness that covers me and fills my limbs with led isn't a gift? Is this how Christ felt as He walked ever closer to the cross? Can we really identify with Him in His sufferings? Maybe not fully, but I think it benefits us to try. For how can we live to Christ if we do not first die to Him? This is the process of sanctification. May the hardships of this life mortify our sin and raise us to newness in life. This is one of the lessons of Lent, I think. There is darkness, but it is not a hollow darkness devoid of hope and promise. The sheer, raw beauty of the cross is that it is not the end. It is the beginning and yet a fulfillment of a plan put into motion before the creation of the world. So great is our Father's love for us. I wrote the words above several weeks ago now but, somehow, forgot and never went back to finish and hit publish. I thought about discarding them all together but they still resonate strongly with me and, I think, are worth sharing. There are a few things we all have in common in this life. The frailty of our human condition and the suffering that results is one of them. There can be beauty in weakness. A purpose to our suffering. Scars can be badges of honor. When God is glorified and our faith increases. It's difficult when we're in the midst of a trial to step back and see what God is doing. We often don't have the emotional reserves or clarity of mind to do so. It's there. It is always there. Grab onto it with both hands of faith. Sit and wait with it, or step out over the cliff with it, whichever it may be that He is calling you to do.